The new s'mores flavor—graham cracker outer cookie with chocolate and marshmallow filling—will be available for just six to eight weeks only starting May 22. Back in February, Oreo hypebeasts were still going crazy over the release of Red Velvet Oreos when someone leaked a photo of S’more Oreos on Twitter. That someone was Michael C. Souza, an employee of Mondelez International (which makes Oreos). It’s official: According to a release from Oreo, the limited-edition S’mores Oreos will be available nationwide (and in Canada) starting Friday, May 22nd—while supplies last. 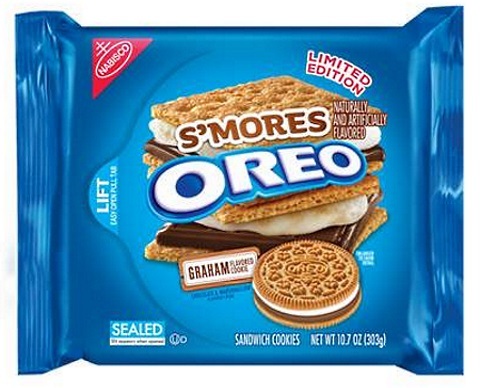 S’mores Oreos will feature the first-ever graham cracker cookie in an Oreo, as well as a chocolate-marshmallow creme filling. The latest limited edition is OREO cookies spin on a classic and we’re excited to introduce S’mores OREO flavored cookies – the perfect way to let fans enjoy summer’s iconic treat no matter where they are – no campfire necessary. We only have one question left: Why aren’t they called #smoreos? We aren’t the only ones asking, either. One more thing: Keane says that the “while supplies last” part of Limited Edition Oreo flavors translates to about six to eight weeks. So if you want a package of S’mores Oreos for yourself, you have about two months to get your Oreo hypbeast self to the grocery store.